Thoracic Outlet Syndrome is a condition whereby nerves, arteries and veins in the neck are compressed as they exit the shoulder. This causes numbness, tingling and pain in the arm and hand. 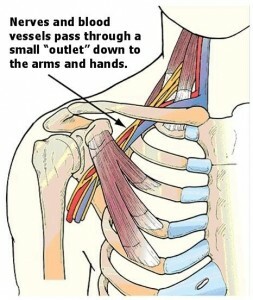 Thoracic outlet syndrome most commonly occurs in women between 25 and 50 years old. The problem can be caused by trauma, repetitive strain or congenital anatomic abnormalities. If only the nerves are involved, the symptoms may be numbness and tingling in the hand, weakness, muscle wasting in the hand or pain in the arm and hand. If the arteries or veins are involved, the arm may turn a bluish color, swell up, become cold or pale and also cause pain. X-rays may show abnormalities of the ribs. An MRI of the brachial plexus is useful to look for tumors in this area. EMG and nerve conduction studies are used to determine the presence and location of nerve injury. Treatment includes physical therapy and medications, including Gabapentin, Carbamazepine and Baclofen. For specific anatomic abnormalities, surgery may be indicated in severe cases.